« What is the difference between the cardiomegaly of Aortic regurgitation and mitral regurgitation ? Heart is one of the unique organs , that a physician can touch and feel before diagnosing a disease .The fact that , the heart is located superficially within the thoracic cavity makes tactile examination possible . The current generation cardiologists should realise cardiac palpation was a huge scientific specialty by itself centuries ago . Apical impulse demonstration in class rooms would go on for hours together in the days of Leannc and Dressler . It is an irony , when we are able to see and feel many areas of the heart in the direct vision ( RV parasternal impulse, pulmonary arterial pulsation, contractility of LV ) we got addicted to imaging modalities now. This article tries to extrapolate the morphology of apical impulse with that of ehocardiographic LV function . A normal apical impulse is a very subtle impulse often absent in a third of population.Some times it is called tapping impulse .The two common abnormalities of apical impulse are hyperdynamic and heaving . 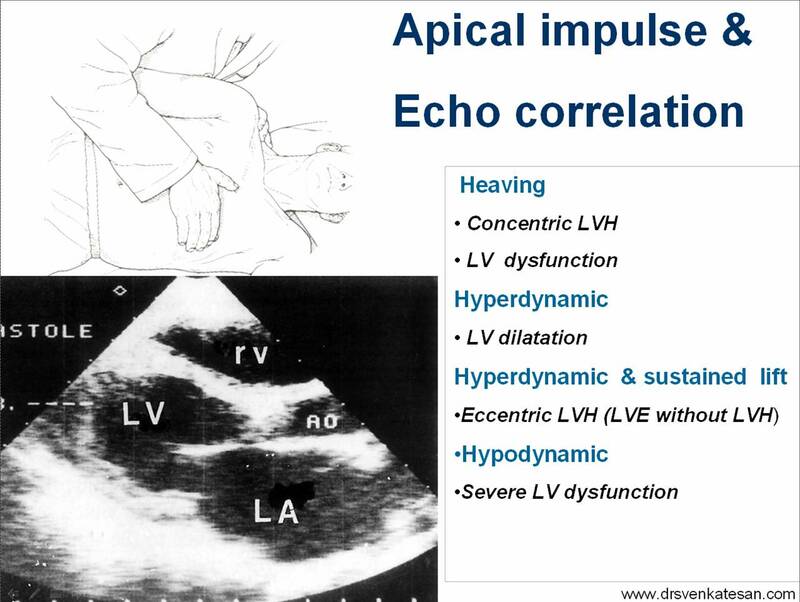 The hyperdynamic apical impulse is diffuse (Occupying at least two rib spaces > 3Sqcms) and very active with brisk motions visible to naked eye .This implies the leftventricle is dilated significantly and the wall is not much hypertrophied. This is eccentric LV enlargement . It also tells us the LV function is well-preserved as the term hyperdynamic infers very active LV .It is obvious , a dysfunctional LV can not be hyperactive. A hyperdynamic LV apex in a patients with AR or MR indicates they will do well after surgery for the simple reason their LV function is preserved. In the same logic a patient with hyperdynamic apex often complaints of palpitation as the apex hits the chestwall . Which is a good sign with reference to LV function . Note :A patient with heaving apex rarely complaints of palpitation. Hyperdynamism occur in systole or diastole ? The term heaving apex by definition indicate there is a brief localized sustained LV apex lasting at least 50% of systole. The sustained lift may disappear with very severe LV dysfunction , apical impulse is barely perceptible in failing hearts . A sustained LV apex suggest reduced dp/dt of LV contractility . Relationship between apical impulse character and LVH ? Hyperdynamic LV apex is rare to be associated with LVH .Except probably in HOCM where the LV systole is interrupted very early in the ejection phase. Heaving apex can be a marker of LVH .But, the onset of LV dysfunction can confound this finding. Can a hyperdynamic and heaving characters occur together in apical impulse? Looking for apical impulse in current cardiology practice may be considered as the most foolish job a physician can indulge ! Ask the secretary to record the history , take an ECG, do an Echo , send both deserving (and of course many undeserving patients too !) to cath lab at the earliest . . . This is the modern-day cardiology mantra ! This article , does not vouch for the accuracy of what some may consider as a “medieval clinical sign” . But , it confers the patient a better rapport strightaway as the physician puts his or her hand on the patients heart . Some call this as a healing touch ! It work wonders in many ! Sir, in case of hyperdynamic apex impulse due to AR why there is not left ventricular wall thickening inspite of working more to push the blood in systemic circulation ? Yes your query is genuine.conceptually LVH do occur even in AR. AR stresses the heart in diastole. We call this volume overload. During systole the LV doesn’t work hard as we think. It operates on its reserve. But the cavity dilates. In fact , we call this eccentric LVH. ie LV muscle mass increases still relative wall thickness is not increased. Note LVH is defined with reference to muscle mass not on thickness.To understand further, you need to know a concept called relative wall thickness.